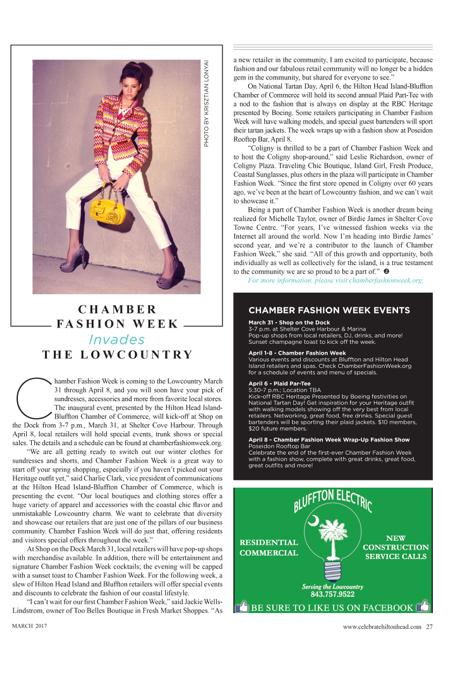 Chamber Fashion Week is coming to the Lowcountry March 31 through April 8, and you will soon have your pick of sundresses, accessories and more from favorite local stores. The inaugural event, presented by the Hilton Head Island-Bluffton Chamber of Commerce, will kick-off at Shop on the Dock from 3-7 p.m., March 31, at Shelter Cove Harbour. Through April 8, local retailers will hold special events, trunk shows or special sales. The details and a schedule can be found at chamberfashionweek.org. At Shop on the Dock March 31, local retailers will have pop-up shops with merchandise available. In addition, there will be entertainment and signature Chamber Fashion Week cocktails; the evening will be capped with a sunset toast to Chamber Fashion Week. For the following week, a slew of Hilton Head Island and Bluffton retailers will offer special events and discounts to celebrate the fashion of our coastal lifestyle. On National Tartan Day, April 6, the Hilton Head Island-Bluffton Chamber of Commerce will hold its second annual Plaid Part-Tee with a nod to the fashion that is always on display at the RBC Heritage presented by Boeing. Some retailers participating in Chamber Fashion Week will have walking models, and special guest bartenders will sport their tartan jackets. The week wraps up with a fashion show at Poseidon Rooftop Bar, April 8. For more information, please visit chamberfashionweek.org. Pop-up shops from local retailers, DJ, drinks, and more! Sunset champagne toast to kick off the week. for a schedule of events and menu of specials. Kick-off RBC Heritage Presented by Boeing festivities on National Tartan Day! Get inspiration for your Heritage outfit with walking models showing off the very best from local retailers. Networking, great food, free drinks. Special guest bartenders will be sporting their plaid jackets. $10 members, $20 future members. Celebrate the end of the first-ever Chamber Fashion Week with a fashion show, complete with great drinks, great food, great outfits and more! Do You Have Gum Disease?